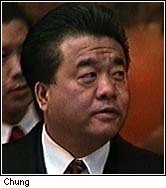 WASHINGTON (March 5) -- Democratic fund-raiser Johnny Chung has agreed to plead guilty to election law violations and cooperate in the ongoing Justice Department investigation into illegal campaign fund-raising in the 1996 elections. Chung's attorney Brian Sun said in a statement released to CNN, "Mr. Chung has reached an agreement with the government. Mr. Chung wants to put this matter behind him as quickly as possible. He and his family are looking forward to getting on with their lives." Chung became a major figure in the Democratic fund-raising scandal when it was learned he made almost 50 visits to the White House. During one visit, Chung gave first lady Hillary Rodham Clinton's then-chief of staff, Maggie Williams, a $50,000 check for the Democratic National Committee (DNC). The check was delivered inside the White House. Two days later Chung was able to bring a group of Chinese businessmen to watch President Bill Clinton deliver a radio address in the Oval Office. They then had their picture taken with the president. The DNC returned more than $300,000 that Chung raised because of questions about the source of the money.